Ordinary Chaos looks at the real, almost-real, unreal, and once-real phenomena that hide behind the veneer of ordinariness. With Kimberly Kruge’s deep focus, daily life unfurls into strangeness—time and space become malleable materials as her observations of seemingly normal objects and situations expand, take on meaning beyond their appearance, and begin a life of their own. As much as the poems address the quotidian, they also consider the mysteries of mortality, awe, mysticism, comprehension, and violence. The pages are laced with an honest sense of sensitivity, fragility, and even impending condemnation—resulting in poems that are resilient but not invulnerable. Kruge, who now makes her home in Guadalajara, Mexico, also explores the immigration process and navigating an adopted country. These experiences all contribute to her transcendent exploration of physical, emotional, and psychological geography. Kimberly Kruge is a poet and translator based in Mexico. She is the author of the chapbook High-Land Sub-Tropic and her poems have appeared in Ploughshares, the Iowa Review, the Missouri Review, RHINO, Copper Nickel, and others. She founded and coordinates Comala Haven, a retreat and workshop in Mexico for women writers. Scale is about a relationship between a father and a son. These poems consider the importance of acknowledging the past as well as the dangers in doing so. 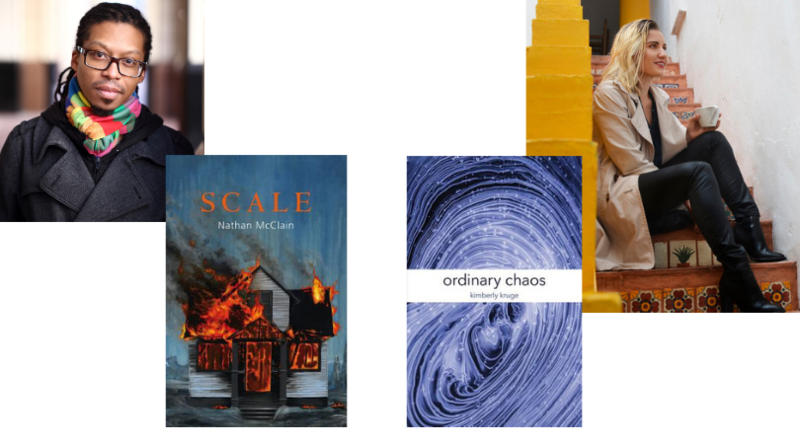 NATHAN MCCLAIN is a recipient of scholarships from The Frost Place and the Bread Loaf Writers' Conference, and a graduate of Warren Wilson's MFA Program for Writers. A Cave Canem fellow, his poems have recently appeared or are forthcoming in Callaloo, Ploughshares, Sou'wester, Iron Horse Literary Review, Southern Humanities Review, Waxwing and elsewhere. He lives in Brooklyn. Ordinary Chaos looks at the real, almost-real, unreal, and once-real phenomena that hide behind the veneer of ordinariness.